This page is in the process of being migrated. It's new home will be matterhackers.com/mattercontrol/support/slice-settings/index. Welcome to the Slice Settings main page! Below you will find links to the categories, sub-categories, and sections of settings for MatterSlice, as well as information about the menus and options available. Starting in version 1.6, settings are automatically synced between instances of MatterControl which are signed in to the same MatterHackers.com account. Updating a setting in one instance will automatically change the setting in all other instances. Both a quality and material preset are applied. When a preset is enabled, the affected settings are highlighted in the color associated with the type of preset. See the Preset Menus section below for more information. Changing a setting from the default will highlight it in blue. Whenever a setting is manually changed from the profile default, a blue highlight appears over the setting and an 'X' icon appears to the right. Clicking the X will restore the default value. The SETTINGS Preset Menus, shown here with the default (no) presets selected. These menus allow the user to save one or more settings as a preset list under one name instead of changing every setting for a particular material or desired quality individually. Both menus essentially do the same thing; the difference is that the QUALITY menu is meant to hold presets of settings unique to different desired qualities and the MATERIAL menu is meant to hold presets of settings unique to different filaments. 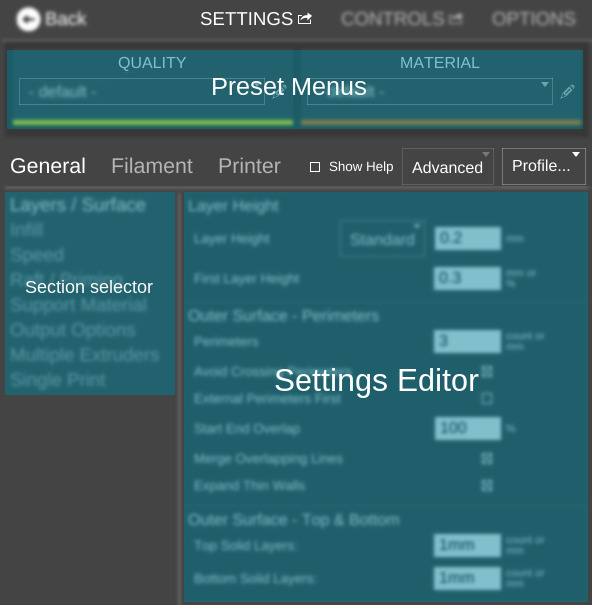 If a selected preset in both menus each contain the same setting, the setting specified in the MATERIAL preset menu trumps the one in the QUALITY menu. Many printer profiles come pre-configured with presets for common filaments and quality settings. The availability of these presets varies widely depending on the printer manufacturers and MatterHackers' internal test and support department. When checked, an explanation for each function will be revealed underneath its name. Basic: The minimal settings group for beginners or those who want to print quickly. Standard: A few more settings than the Basic level, but not the complete list. Advanced: All MatterSlice slice settings displayed. The Options... menu has five functions: Show Help, Import, Export, Restore Settings, and Reset to defaults. Import allows the user to load a slice settings file (.slice, .ini, .printer) into MatterControl. Any existing values will be replaced by those in the file. Export allows the user to save all current slice settings values to file. Restore Settings opens the 'Restore Settings' window, allowing the user to select from the last ten automatically-saved configurations and restore one. Reset to defaults resets all settings back to their default values taken from the printer profile. This page was last modified on 6 September 2018, at 13:35.